This is a hauntingly beautiful poem, one to ponder on for days. really nice visceral poem. agree with the line ‘this night is full of last breaths’ being a winner. You’ve expressed this in ways no op-ed piece or talking head could dream of touching. Brilliant. Very evocative and disturbing at the same time, and touching to find some grace amid turmoil. Is this from experience, or feelings? Either way, well done Elan. I would have to say it comes from both experience and feelings. Very thought provoking and relatable. Words woven wonderfully… nice post! If we allowed ourselves, subconsciously we would know the right actions. I wrote blogpost Breat of Life – https://neerja2014.wordpress.com/ with a pingback to you. This is wonderful, well done! I love how you explore the connection between breathing and so many others things – two people, the present, the future. This poem hurts in the best way. Oh my, you have some wonderful poetry, Elan. I’d like to follow you to learn more about the craft from you. Wow, once again powerful commentary on life in America in the 21st Century, how sad for us and even sadder for the victims and their families. Exquisitely meaningful poetry. It felt like it jut flowed from your heart. Yes, all lives matter and we see them drift away in so many different ways. Thank you, but I must decline. Powerful, beautiful words about the simplest and most essential things. It is heartbreaking and heartwarming at the same time. Your words are simply riveting. Sure, no problem. The choice is yours 🙂 Have a good day! Poignant words that portray so much! Wow! Besides touching the guts of us all, these words might find a wall in many Trauma Centers and ER’s . ….Proud….. This photo is familiar; is it Irish Archives? Some of those old black and whit shots make great jumping off points. This is a great poem. 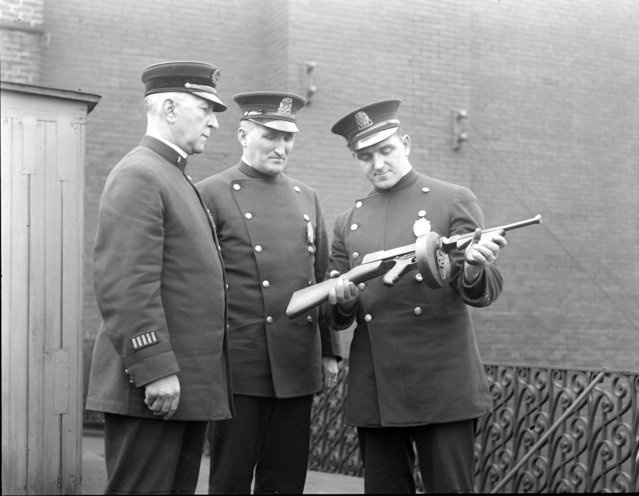 I believe these are Chicago cops from the 1920s. I wrote a poem about bankers from an Australian Archive photo. I’ll post it on Poetikat Unbound. It’s just a fun one–with bite. I don’t use photos as prompts, if that’s what you mean. After the poem is finished, I go and search for an image. It’s as if the words acquire life in your poetry. For, each silent space between the words feels like a breath spent in worthy reflection. Very well-expressed. A beautiful and powerful piece! WOW, and I was just outside listening to crickets and stars breathe before I came in and read this. Great poem.